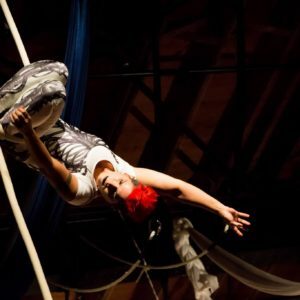 fit for sport, to know that they’re welcome in the aerial community and that THEY CAN DO THIS.” At Bumbershoot Aerial Arts in St. Louis, Alison produced and performed in 3 successful aerial student showcases. 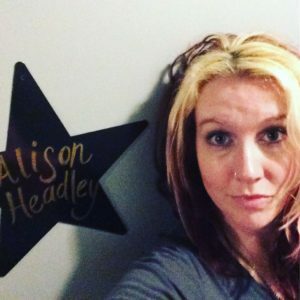 In her spare time, Alison enjoys reading, spending time with her family and her dog, and laboring over woodworking projects with varying degrees of success. April and Alison met in St. Louis several years ago. We realized we shared a love of performing, teaching, and creating. Our mutual love of all aspects of aerial art led to endless hours of dissecting training ideas, technique, and creative fitness solutions. We never get tired of this stuff. Aerial arts is our joy and our continuing conversation. We both also enjoy the technical rigging challenges of our art form, with April happily working at height and Alison devising creative solutions for rigging challenges. We have worked together on producing large student showcases, Alison as the producer with April creating the rigging arrangements needed for the show to succeed. April conceived of and produced a monthly free aerial show called “First Fridays Aerial Show and Tell.” for the local community, acting as producer and ringmaster with Alison’s support. We also worked together extensively as the rigging team at Bumbershoot Aerial Arts, addressing all the studio rigging needs, from routine changes and maintenance to large year end inspections and projects. Together, we kept our former studio functioning at or above industry safety standards. We have combined forces at local political events, using circus and costuming to speak truth to power. 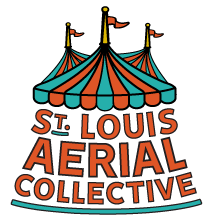 During the summer of 2017, we performed with several fellow aerialists at a weekly outdoor aerial performance at the Strauss Park ALIVE Festival, calling ourselves The Little Circus That Could. 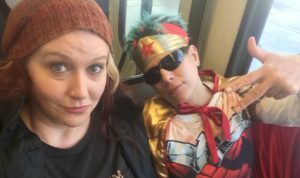 April and Alison have also worked at events together to support Missouri Women in Trades, a local nonprofit supporting women, LGBT, and minority access to careers in the construction industry.